In retrospect, Mayfield Village's Richard and Laura Storey say the 2004 establishment of Handy Firemen Co. was dually influenced by life at work and at home. 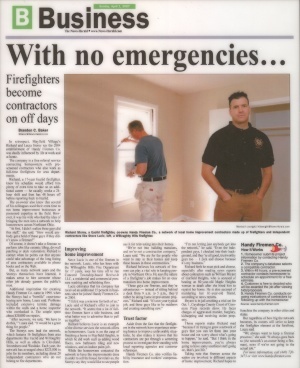 The company is a free referral service connecting homeowners with prescreened contractors who also work as full-time firefighters for area departments. Richard, a 17-year Euclid firefighter, knew his schedule would afford him plenty of extra time to take on an additional career - he usually works a 24-hour shift and then has 48 hours off before reporting back to Euclid. The co-owner also knew that several of his colleagues used their extra time to run home improvement businesses or possessed expertise in the field. However, it was his wife who had the idea of bringing the men into a network to help homeowners across Northeast Ohio. "At first, I didn't realize these guys did this stuff," she said. "How would anybody get a hold of these guys if they didn't know a fireman?" Of course, it doesn't take a fireman to perform jobs like ceramic tiling, drywall patching or deck restoration; Richard is correct when he points out that anyone could take advantage of the long listing of area contractors available in phone books and on the Web. But, as many network users and the Storeys themselves have learned, it makes sense to hire someone whose other job already garners the public's trust. Additional inspiration for creating Handy Firemen Co. came in 1999, when the Storeys had a "horrific" experience buying a new home, Laura said. Problems included extensive termite damage within the walls and a home inspector who overlooked it. The couple spent about $30,000 on repairs. "After recovery, we said, 'We have to do this,'" Laura said. "It would be a great thing for people." The Storeys now lead the network, which features 16 firefighters from area departments like Euclid and Willoughby Hills, as well as others in Cleveland, Streetsboro and Westlake. Each year, the network has averaged about $225,000 in jobs for it's members, including about 20 independent contractors who do not belong to fire departments. Steve Lucic is one of the firemen in the network. Lucic, who has been with the Willoughby Hills Fire Department for 17 years, uses his time off to run Concord Township-based Revive-It LLC, a residential and commercial pressure washing and refinishing firm. Lucic estimates that his company has received an additional 15 percent in business since he joined Handy Firemen Co. in 2004. "I felt it was a win/win for both of us," Lucic said of Richard's offer to join the network. "It seems that a lot of fulltime firemen have a side business and what better way to advertise than to pull us together." Richard believes Lucic is an example of the diverse services the network offers to homeowners. Lucic is on the cusp of finishing a home in Mayfield Heights, in which he did work such as adding wood floors, new bathroom tiling and new windows, and an indoor paint job. While the homeowner contacted the network to have the improvements done in order to sell the house for relatives, the Storeys say they would like to see people use it for reinvesting into their homes. "We're not into building mansions, and we're not a construction company," Laura said. "We are for the people who want to stay in their homes and keep these houses in these communities." Richard believes his network of firemen can play a vital role in keeping people in Northeast Ohio. He said the nature of a firefighter's job makes for an easy transition into home improvements. "These guys are firemen, and they're adventurous- instead of sitting behind a desk from 9 a.m. to 5 p.m., they'd rather be doing home improvement projects," Richard said. "It's not your typical job, and these guys like to be outdoors and creating something new." Aside from the fact that the firefighters in the network have experience entering homes to improve unfavorable situations, he also makes it known that his contractors are put through a screening process to investigate their standing with local reporting agencies and customer references. Handy Firemen Co. also verifies liability insurance and workers' compensation. "I'm not letting just anybody get into the network," he said. "Even the independent guys, I checked into their background, and they're all good, trustworthy guys too - I pick and choose because it's my business. " Richard feels he must pick and choose, especially after reading new reports about contractors such as William Bryant of Garfield Heights, who is accused of beating an 80-year-old Maple Heights woman to death after she hired him to repaint her home. He is also accused of murdering her 91-year-old friend, according to news reports. Bryant is in jail awaiting a trial set for Oct. 1, Cuyahoga County Court of Common Pleas records show. He faces charges of aggravated murder, burglary, kidnapping, and receiving stolen property. Those reports make Richard mad "because I'm trying to grow a network of guys that you can let them into your house and not worry about what's going to happen," he said. "But I think in the home improvements, you're always going to have some unethical stuff going on, that's just life." Taking note that firemen across the nation are involved in different aspects of home improvement, Richard hopes to franchise the company in other cities and states. But regardless of how big the network becomes, its owners will strive to keep the firefighter element at the forefront, Laura said. "We always want to keep a fireman presence," she said. "It always goes back to (the network's co-owner being a fireman), even if we're not going to the actual job."